This is one of those books that stun you. They take you by surprise and you do not really know what got into you. You do know that you loved reading it and cannot stop talking about it to people. “2 A.M. at the Cat’s Pajamas” is a book that demands your attention and once it has it, it does not let go, till you have finished the book. I remember reading about this book somewhere and I so wanted to read it and when I did, I fell in love with it. Marie-Helene Bertino writes with such simplicity and makes you want to believe in all things nice and hopeful. Her characters are despairing, but never let go of hope and what it takes to be alive. There are odd moments in the book and yet what they only do is uplift you. “2 A.M. at the Cat’s Pajamas” is a magical story. It is a story of three lives, colliding by coincidence; chance, by serendipity on Christmas Eve eve. The action takes place in Philadelphia. We all know how a city becomes a character in so many books and it is the same in this one as well. There is a nine-year old Madeleine, who has recently lost her mother. She is clueless in the world. She smokes (yes for a nine-year old, I was taken aback but then got in the groove of the book). She wants to sing. She is obsessed with Jazz. At the end of the spectrum is her teacher, Sarina, who is recently divorced and something is soon going to happen to her. The third character is Lorca, the owner of The Cat’s Pajamas – a legendary jazz club, which is soon going to slip away from him. These three characters come together to discover love, life, happiness and hope. The characters that meet each other in the course of a day and night are marvelous. There are other characters as well besides these three that add to the plot and drive the story forward. What struck me the most about the book is the honest voice in which it is written. The book is told from the third-person perspective and rounds up every emotion and scene very well. Bertino sets the story in such a way that everything is told or not told till 2 A.M, which in more than one way is the crux of the book. “2 A.M. at the Cat’s Pajamas” is a charming, little book that makes you reinstate hope. As these three go through the day, and you with them as a reader, your spirits are lifted, you smile and laugh with them and feel a sense of melancholy when they are sad. Sometimes, it is also necessary for a book to have those brilliant fantastical moments (like Mark Helprin’s books do) to reinforce the magic of living. 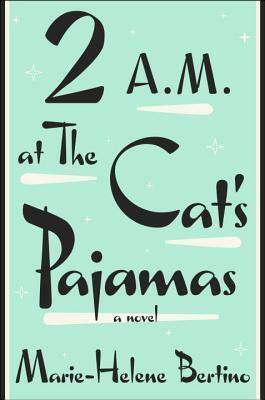 “2 A.M. at the Cat’s Pajamas” is a perfect book for the time when you are down and about. 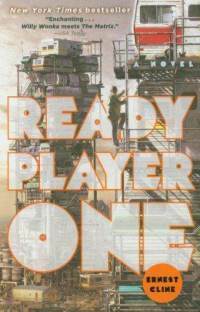 This entry was posted in Books, Crown Books, Literary Fiction, Review and tagged 2 A.M. at the Cat's Pajamas, Blog for Books, Crown, Faith, hope, Love, magic, Marie-Helene Bertino, Philadelphia on August 12, 2014 by thehungryreader. A lot of books have been written about the Second World War by now. More so from the perspective of the Holocaust and nothing else. At times, you also think that you have read it all. After all, how different can one story be from the other? I have always thought that or rather used to. To read enough all the time about a particular incident does not make you an expert on it. Nothing can till you live it. That I guess just holds true for any human life. It has to be endured, and lived and sometimes chronicled. 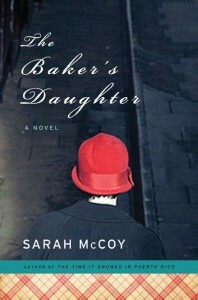 “The Baker’s Daughter” was an interesting read for me this month. Though it started very slowly and did not interest me initially, it picked pace at about page fifty or so and from then on did not let go. The year is 1944 and the Third Reich rule Germany. Elsie Schmidt is sixteen years old and the youngest daughter of a baker in Germany. Everything seems to be going fine in her life, till she discovers a surprise in her house and from there on life changes course and events unfold. This is further complicated with another track, years later, in late 2000’s, practically sixty years later, when the past emerges and threatens to merge with the present. For now, this is all that I can give away. Why should you or anyone else for that matter read this book? Because according to me, the book is written the way it should be. It is precise in its plot and the emotions it wants to convey with every turn of the page, which as a reader, matters the world to me and my sensibilities. It is well-researched and almost makes you think more of men and women thrown in extraordinary circumstances and what they must do to survive and make decisions against their nature. There were times in the book that I got a little bored by the description, but as I read further, I understood that it had its place and could not be done without. The two story lines are fantastically juxtaposed and more intelligently so. The shifting in timelines does take some time to get used to, however once you do, then it is a cakewalk. Elsie’s story and character is but obviously the stronger one, however the second track is equally important and needed. The setting is quite challenging given the number of books already written on this subject, both fiction and non-fiction. McCoy does a fantastic job of chronicling the side of the Holocaust that is rarely written or talked about – the German side (this is to give you an inkling to the rest of the story without giving away anything about the plot). This entry was posted in Books, Crown Books, Literary Fiction, Review and tagged Broadway Books, Crown Books, germany, literary fiction, random house, Sarah McCoy, The Baker's Daughter, USA on March 23, 2013 by thehungryreader.